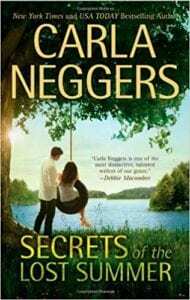 Two extremely interesting plotlines are melded together in this latest ‘gift’ from Carla Neggers. A story taking place in the late 1930’s - just before the start of World War II - intermingles perfectly with a story of Olivia Frost, a graphic designer living in present day Boston. After some serious professional setbacks in her career, Olivia leaves her job and returns to her hometown of Knights Bridge in Western Massachusetts. Buying a historic home, she plans to follow what has been her dream for quite some time and open a Bed and Breakfast in the picturesque town. She is full of hope as she begins to transform this old house into a favorite meeting place for friends and strangers alike. The location is absolutely perfect except for one blatant eye-sore; just a few paces down the road there’s an abandoned house that needs a whole heck of a lot of clean up and it’s making her property look bad. The absentee owner, Dylan McCaffrey, is an ex-NHL player who is now a businessman in California. He actually has no idea that he has inherited this house in Massachusetts from his deceased father until he receives a letter from Olivia and ends up traveling to Massachusetts to look the situation over. Dylan is actually very confused, and decides to stick around to find out why his father - who’d been a treasure hunter who lived all over the world - bought this place out in the middle of nowhere. The duo discover a file describing some stolen jewelry; and are also told an old tale by the former owner of the house, Grace Webster, who’s living out her life in a nearby nursing home. As a story unravels from the 1930’s, the past meets the present and makes for a fascinating narrative that involves suspense, romance and a mystery that soon will be solved. The greatest facet of this book is the love story that was born in the 1930’s and how it creates a romance in present day that’s truly beautiful. Saying this is a fantastic read is really no surprise, considering that’s all Carla Neggers ever writes. Quill Says: The plotting is perfect, the characters are fascinating, and the contemporary romance mingled with a ‘lost-love’ tale is unforgettable.